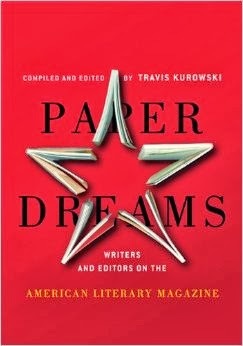 Paper Dreams, edited and compiled by Travis Kurowski, is a book that chronicles the evolution of the literary magazine, and should be considered as the contemporary go-to resource for discovering and referencing such things as the early history and development of the literary magazine. Our world, being that it is technologically and virtually-minded, makes publishing as easy as the click of a mouse. Getting your work out there has been simpler than ever. However, getting it to stick, to be noticed, read, gain notoriety, well, that is a different story—a story that literary magazines are willing to pick up. Kurowski assembled a book that serves as more than a do and don’t list for publishing literary magazines. Rather, Paper Dreams is a guidebook offering articles from classic writers and editors like Ralph Waldo Emerson, Ezra Pound, and Harriet Monroe, to the contemporaries such as Eric Staley, Ian Morris, and Jodee Stanley, among others, serving as a compass for aspiring editors and writers seeking to publish or be published in a literary magazine. Divided into six parts, Paper Dreams leads the reader on a journey through the beginning of the literary magazine, to the modernist period into the age of the mimeograph, leading to the transformation from old school to contemporary publishing methods and eventually to the total revamp of the literary magazine into what it is today, and really always has been—a showcase for art. Technology has made publishing easy. However, the one issue that is discussed at length is the survival of the literary magazine. Eric Staley wrote, magazines’ “longevity is often determined by how quickly they can adjust to changes in taste or how readily they can abandon a formula that is not saleable,” (30). However, it is important to note that many of the contributors stand by the fact that taking risks for the sake of art is far more important than revenue. Advancing the literary community, and the world at large, is invaluable. Lovers of literature find solace in worlds where their life disseminates around them and they become enraptured in another parallel universe. Literary magazines can make that happen. They are a place where readers can go to escape, or at least they should be. Kurowski and company recognize this. Various contributors offer bits of advice that have come from experiencing the pitfalls and successes of the literary magazine business. The articles included can get aspiring entrepreneur, editor, or writer from point a to point z, guiding the way, providing a myriad of possibilities and directions. Paper Dreams is an excellent source for writers looking to be published, and for editors searching for ways to sustain their literary magazines. Kurowski has condensed the overwhelmingly abundant caldron of information on the lit mag and provided a reliable supply of articles that accurately portray the history of literary magazines and where the industry of publishing is taking them. If you’re a writer interested in literary magazines, getting published, or you’re an editor or founder seeking advice on the start-up and continuity of a literary magazine, or maybe just an interested reader, Paper Dreams is the book for you.